Each year, it is estimated that a retailer loses close to 3% of its revenue due to shoplifting in the store. According to the National Association for Shoplifting Prevention, there is no profile for a shoplifter. Men and women steal equally as often. However, 75% of shoplifters are adults and only 25% in their teens or younger. Which proves that it is not a "phase" or young person crime. And of those who do shoplift, they report only being caught 1 in every 48 times they steal. In all cases of "prevention", the potential shoplifters reported that employees who practiced solid customer service through greeting and attending to them was the main deterrent. Good store management can be an effective tool against shoplifting. Retailers should also use store layout, adequate inventory controls and follow common security practices to combat shoplifting. 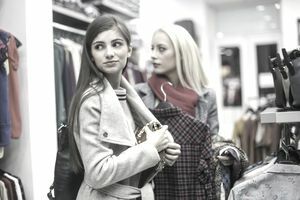 If your store has been designed to reduce shoplifting, another form of prevention is to use customer service techniques to take away opportunities to steal. Staffing: Schedule an adequate number of employees to work at one time. Too many stores only have one employee working at a time. When that employee goes to the back room or even to the bathroom, the store is left empty and is an easy mark for a shoplifter. Greetings: Greet every customer that enters the store. This lets the customer know you are aware of their presence. Be Attentive: Make yourself available to all customers and never leave the store unattended. Receipts: Give each customer a receipt for every purchase. Require receipts for refunds for cash. Trash any discarded receipts immediately. Stay Focused: Don't allow customers to distract the cashier while another person is being checked out. Bag Check: Implement a policy and procedure for backpacks and bags brought in by customers. This one is not a customer favorite and I would avoid making it an automatic practice. Code 3: If you notice suspicious activities, alert other employees immediately. Many stores have a security code to alert staff of possible shoplifters. Helping Hand: Approach the suspicious person and ask if he/she is finding everything okay. Mention that you’ll be nearby should he/she need your help. Make the shoplifter feel watched. Tag Swap: Cashiers should watch price tags and be on the lookout for price switching. Ask for a price check if something seems out of place. Hidden Items: Shoe boxes, pocketbooks, baskets with lids and any other product easily opened should be inspected by cashiers to be sure it does not contain other merchandise. Sealed Shut: Every bag should be closed. Many stores have gone to a sealed bag system. Now if you are one store of about 2,000 square feet you probably read a lot of that last part and thought "that's way too much" and you are right. Those policies are designed for larger stores. And the last thing you want to do is create a shopping experience that feels like a big box retailer. Electronics retailer Fry's is notorious for being so strict on all of their shoplifting and theft policies that customers feel like criminals when shopping there. In their words, the customer feels like they are not trusted by the retailer - and that's because they are not. Imagine if Nordstrom checked your bag when you entered or put you through a series of embarrassing questions to make a return. Protect your brand as much as you protect your merchandise. In my shoe stores, we knew that our service might open the door for a bad customer to take advantage of us, and some did. But the benefit of the shopping experience is so superior and pleasant was worth losing a little every now and then.